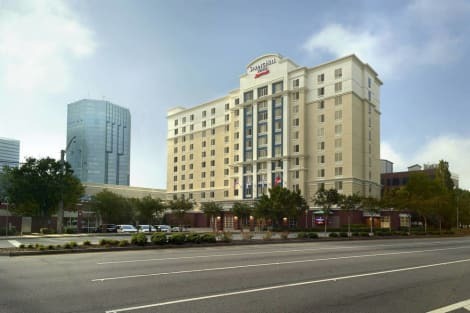 With a stay at Atlanta Marriott Buckhead Hotel & Conference Center in Atlanta (Buckhead), you'll be a 3-minute walk from Lenox Square and 11 minutes by foot from Legoland Discovery Center. This 4-star hotel is 0.6 mi (0.9 km) from Phipps Plaza and 4.8 mi (7.8 km) from Atlanta Botanical Garden. Make yourself at home in one of the 166 air-conditioned rooms featuring refrigerators and minibars. Wired and wireless Internet access is complimentary, while 32-inch Smart televisions with cable programming provide entertainment. Private bathrooms with showers feature rainfall showerheads and hair dryers. Conveniences include safes and desks, as well as phones with free local calls. Enjoy a meal at the restaurant or snacks in the hotel's coffee shop/café. Quench your thirst with your favorite drink at the bar/lounge. Continental breakfasts are available daily from 6:00 AM to 10:00 AM for a fee. Make yourself at home in one of the 150 air-conditioned rooms featuring kitchens with full-sized refrigerators/freezers and stovetops. 42-inch flat-screen televisions with cable programming provide entertainment, while complimentary wireless Internet access keeps you connected. Conveniences include phones, as well as desks and microwaves. Enjoy recreational amenities such as an outdoor pool and a 24-hour fitness center. Additional amenities at this hotel include complimentary wireless Internet access, concierge services, and a television in a common area. Guests can get around on the complimentary shuttle, which operates within 2 miles. With a stay at Residence Inn By Marriott Atlanta Buckhead in Atlanta (Buckhead), you'll be within a 10-minute drive of Lenox Square and Atlanta History Center. 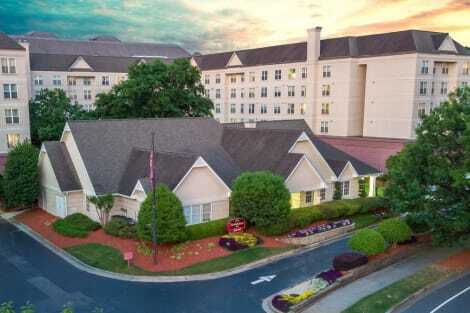 This aparthotel is 3.2 mi (5.1 km) from Atlanta Botanical Garden and 5 mi (8 km) from Emory University.